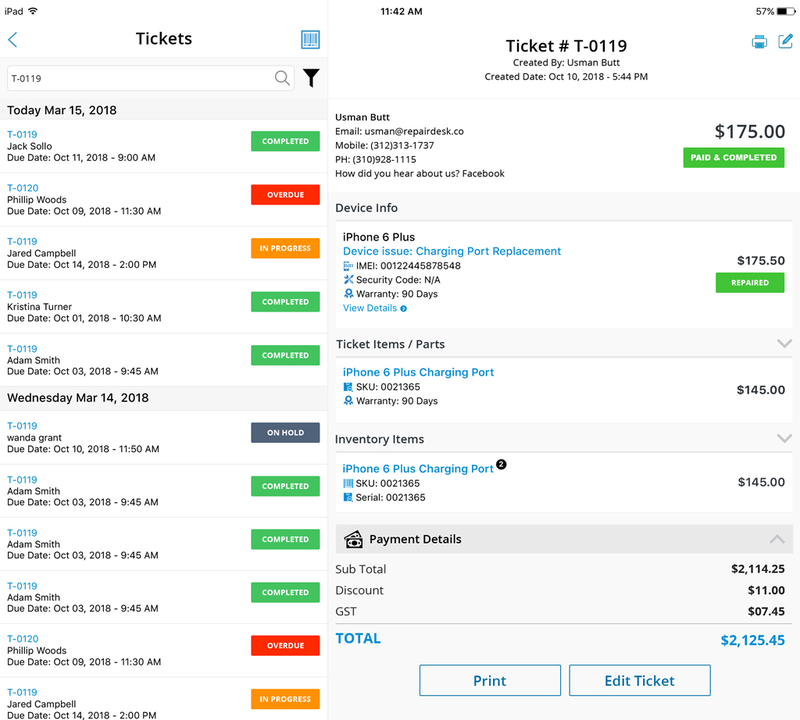 RepairDesk's iPad App allows you to create a professional invoice right from your ticket. It does not even take 2 minutes to get ready. 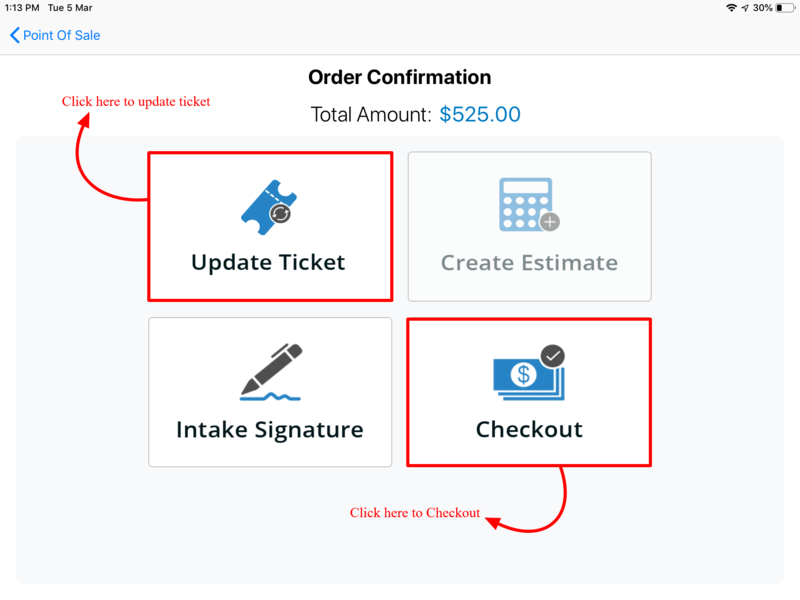 Here are the few steps you might want to follow in order to convert your ticket into an invoice. 1. Open your tickets by going in to view tickets. A screen like this will appear on your iPad screen. Click on Edit icon appearing at the top right corner of screen or you can edit the ticket by using "Edit Ticket" button at the bottom of screen. 2. On hitting edit ticket button, the ticket will be re-opened on POS from where you can edit it by sliding left on item that you want to edit. You can see the blue button Update and Checkout at bottom of the screen. Click that button to update ticket details and checkout. You will be directed to following screen where you can either hit Update Ticket to save edited ticket or Checkout to make payment. 3. By hitting checkout, you will see the following screen asking you for the payment options. Select the most suitable option and click on complete payment. 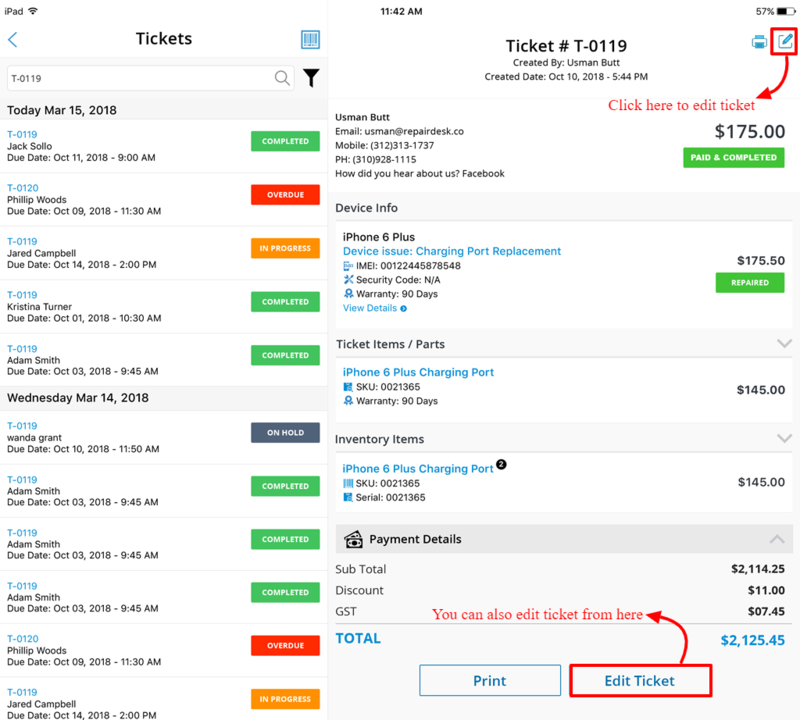 These easy steps will convert your any ticket into an invoice. 6. Now a screen like this will appear on your screen asking you for the payment options. Select the most suitable option and click on complete payment. Once the process completes an invoice would be generated for you. Q. 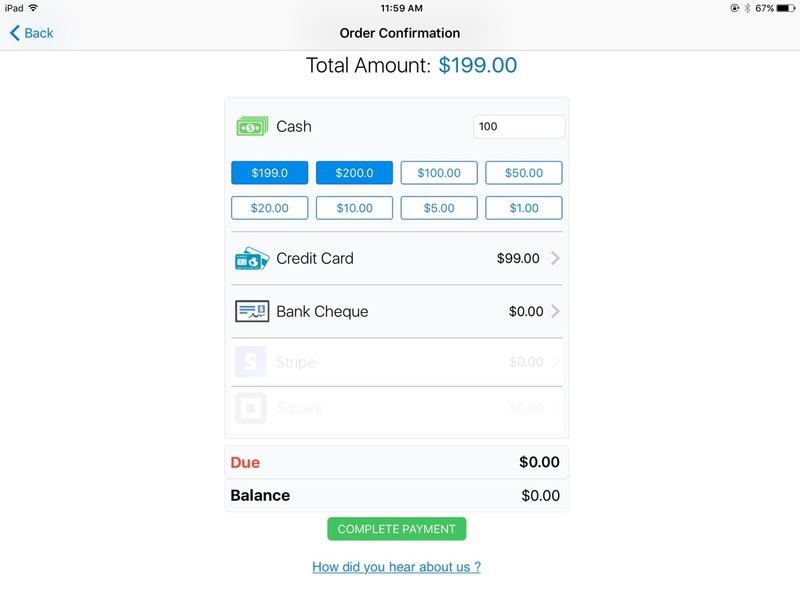 Can I directly create an invoice using RepairDesk's iPad App instead of converting a ticket to an invoice? A. For accessories you can definitely do so! If you simply want to create an invoice for an accessory item, select the item, click on checkout and then again tap on Checkout . Q. 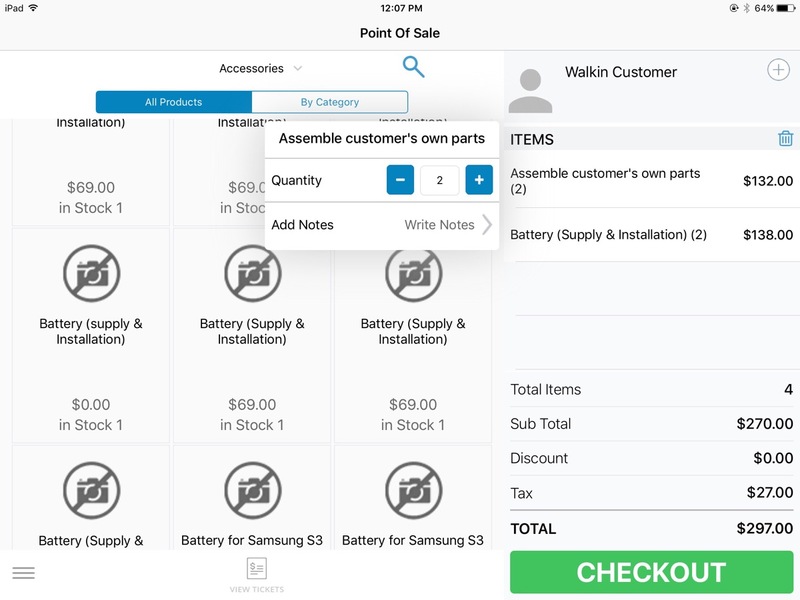 Can you print an invoice from the iPad app using google print ? A. Sure you can. To print an invoice from iPad App using Google Cloud Print please configure Google Cloud Print using a desktop computer via RepairDesk's Web App and whenever you create an invoice or a repair ticket using an iPad it will send the print command to the printer connected to your PC via Cloud print. To know more about how to configure Google Cloud Print on your desktop, please go through this knowledge-base article: How Can I Use Google Cloud Print? Q. 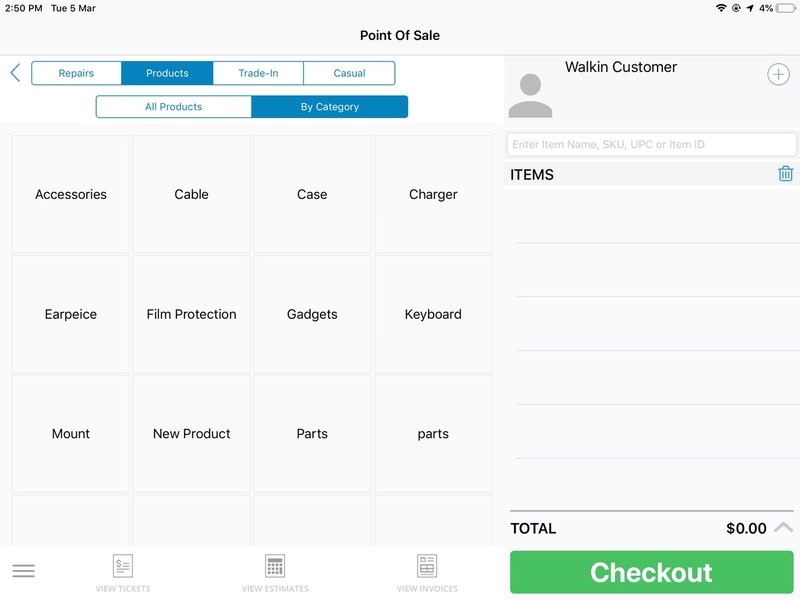 Can I re-open and pay an unpaid invoice from iPad POS Register app? A. 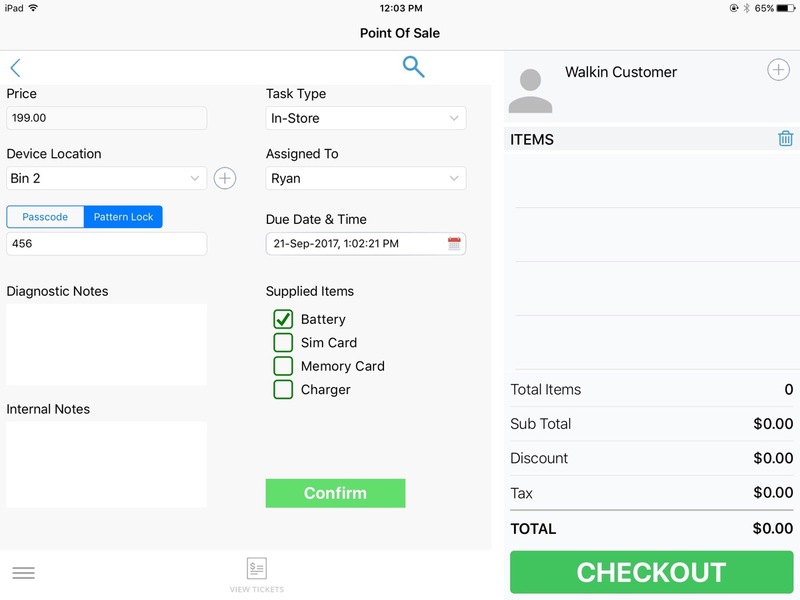 Yes you can re-open and pay an unpaid or partially paid invoice from iPad POS Register app. 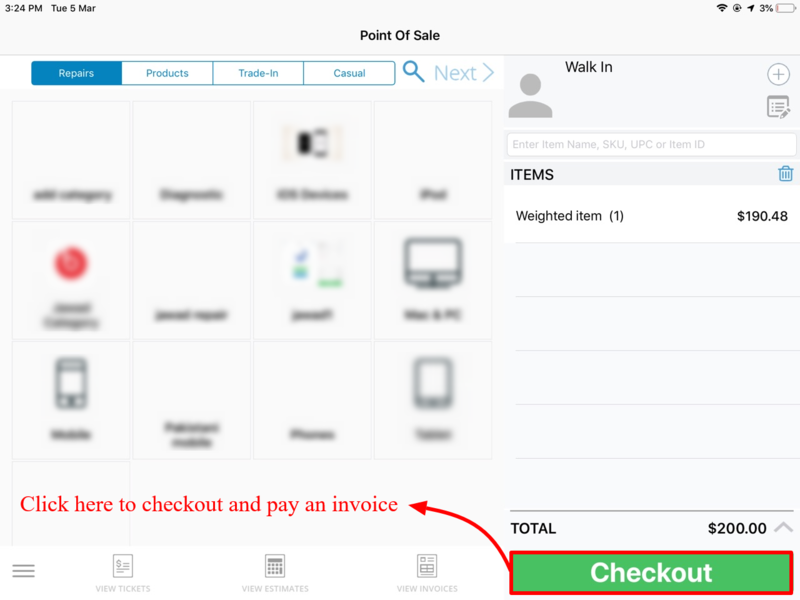 Simple re-open an invoice from Manage Invoices section on POS. 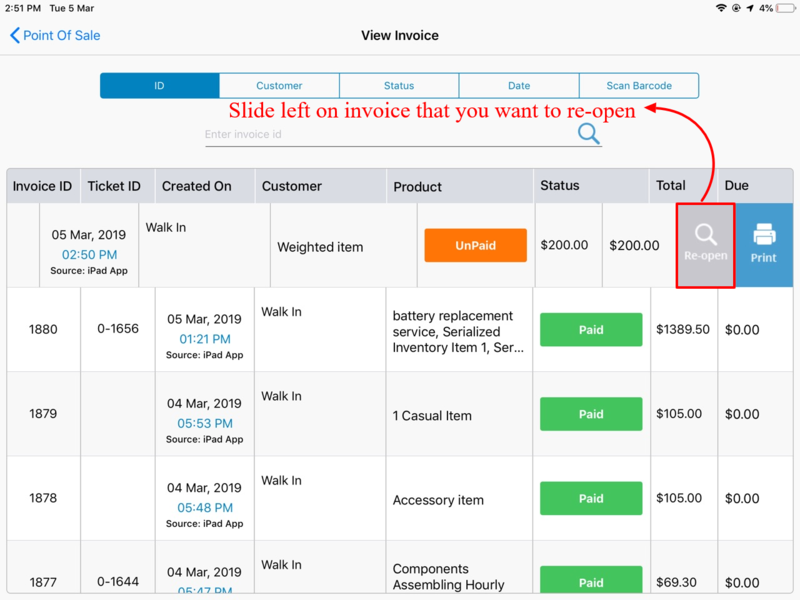 Slide left on invoice that you want to pay and you will get an option to re-open invoice. When an invoice is re-opened on POS, you will get the option to checkout from where you can add payment and convert an unpaid or partially paid invoice to fully paid invoice. 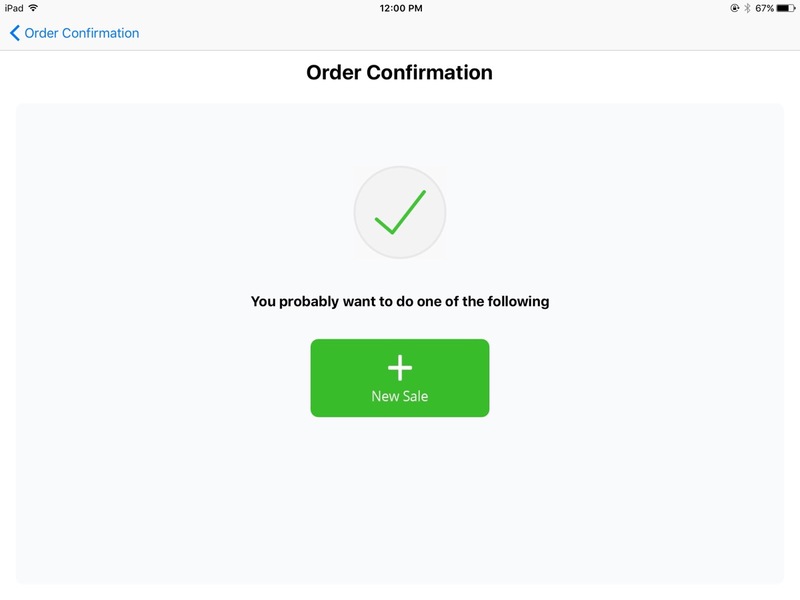 You will be directed to following screen having multiple options to pay the invoice. 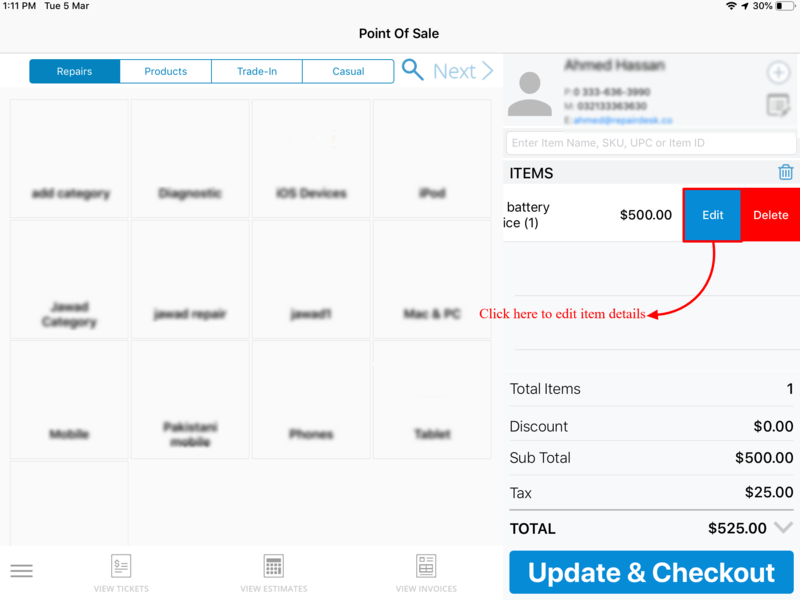 Select payment method, add payment amount and hit complete payment button. Note: Please note that if an invoice is already paid, then you will have an option to re-open it but you will not be allowed to checkout. 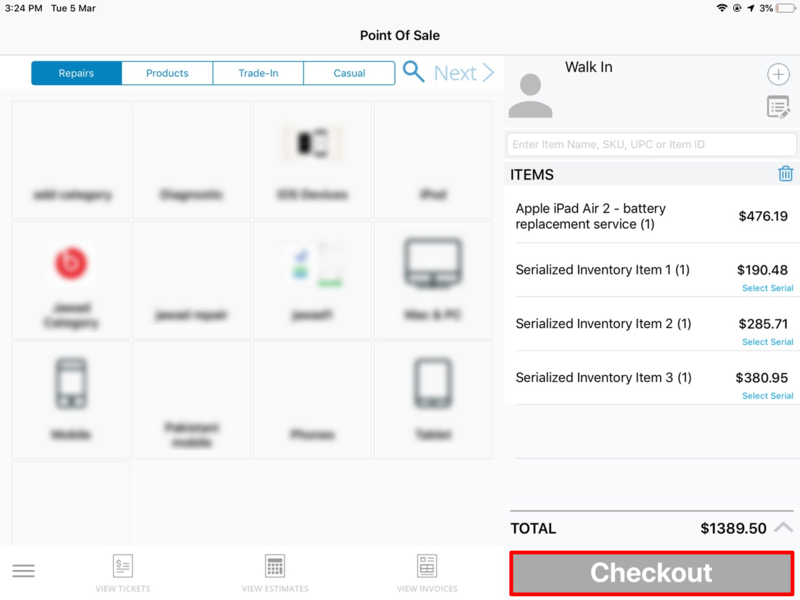 Option to checkout will be greyed out in this case.